Create, work, and play with peace of mind on the strikingly designed Pavilion All–in–One PC. 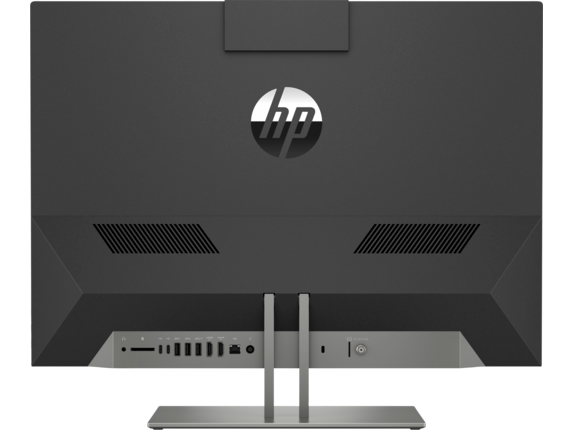 All your activities become easier and faster than before with the performance of a powerful PC. 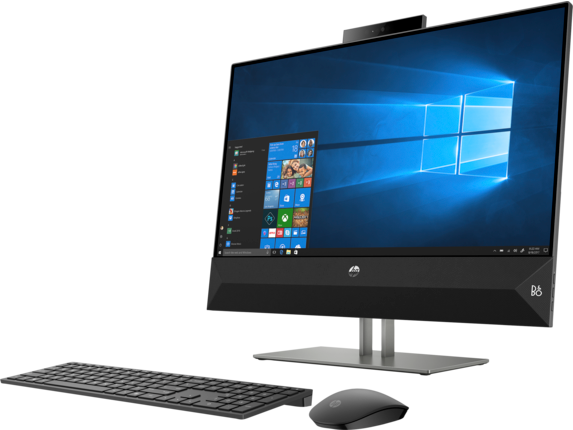 Enhance your computing experience with the latest processors from Intel® and AMD®. Enhance virtually anything you do with powerful discrete graphics. Available on select models. 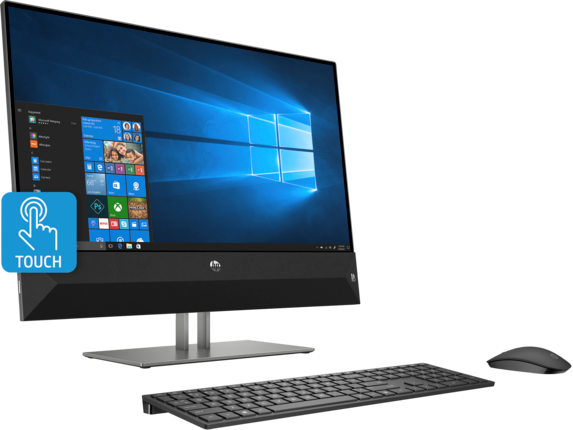 Elevate every video, photo, and sound with up to a QuadHD3 narrow bezel touchscreen and enhanced audio technology. 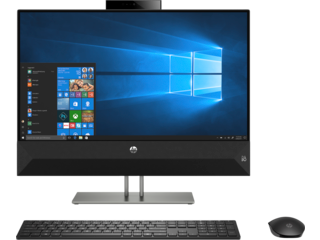 Intuitively control your PC with just a touch, and get unforgettable image quality with over 5 million pixels and 178° wide–viewing angles. HP Dual Speakers, custom-tuned by experts at B&O PLAY, deliver rich, authentic audio. The narrow bezel display delivers an edge–to–edge viewing experience in a smaller footprint. Audio technology designed to boost volume for intense and clear, cinematic surround sound. Stream music from your smartphone to your PC using Bluetooth® technology. Designed to be stunning in any setting with an ultraslim profile and aluminum stand for maximum durability. Our unique die cast aluminum frame with satin finish and steel plate base provide structural integrity and a polished look. Adjustable display with tilt from -5 to +25 degrees for comfortable viewing in any position. Multiple ports strategically placed to keep your workspace tidy. Dual front–firing speakers are finished with fabric to enhance acoustic transmission. For hard drives, TB = 1 trillion bytes. Actual formatted capacity is less. Up to 35GB of hard drive is reserved for system recovery software. Features may require software or other 3rd party applications to provide the described functionality. Quad high-definition (QHD) content is required to view QHD images. Not all features are available in all editions or versions of Windows. Systems may require upgraded and/or separately purchased hardware, drivers, software or BIOS update to take full advantage of Windows functionality. Windows 10 is automatically updated, which is always enabled. ISP fees may apply and additional requirements may apply over time for updates. See http://www.microsoft.com . 7th Generation Intel® Core™ i processor or later required. Intel® Optane™ memory system acceleration does not replace or increase the DRAM in your system. Supports devices with Android 5.0 and beyond and iPhone with iOS 11. Bluetooth must be turned on in setting for device detection and data charges may apply. Bring your digital world to the center of your home with the strikingly designed Pavilion All-in-One PC. An integrated pop-up camera safeguards what matters most, so you can create, work, and play with confidence. Internet service required and not included. Subscription required after 30 days. 17 Up to 512MB of main system memory may be allocated to support video graphics. EPEAT® Bronze registered where applicable. EPEAT registration varies by country. See www.epeat.net for registration status by country. Search keyword generator on HP’s 3rd party option store for solar generator accessories at www.hp.com/go/options . Service levels and response times for Care Packs may vary depending on your geographic location. Restrictions and limitations apply. Service starts at date of hardware purchase. HP Care Packs are sold separately. For details, visit www.hp.com/go/carepack-services. Features may require software or other 3rd party applications to provide the described functionality. Internet service required and not included. 17 All specifications represent the typical specifications provided by HP's component manufacturers; actual performance may vary either higher or lower. 14 Intel® Optane™ memory system acceleration does not replace or increase the DRAM in your system. Intel®, Intel® Core™ and Intel® Optane™ are trademarks of Intel Corporation in the United States and/or other countries. 19 Multi-core is designed to improve performance of certain software products. Not all customers or software applications will necessarily benefit from use of this technology. Performance and clock frequency will vary depending on application workload and your hardware and software configurations. Intel’s numbering is not a measurement of higher performance. Intel, Pentium, Intel Core, Celeron, Intel logo and the Intel Inside logo are trademarks of Intel Corporation in the U.S. and other countries. 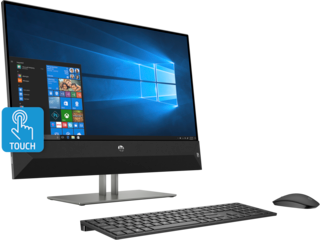 If you want to connect to the world without being surrounded by a world of equipment, we've got all-in-one computers that are perfect for you. Looking for a clean PC solution? You won't find one tidier than an HP All-In-One Desktop. It has the sleek style you expect from HP, plus the extra space that comes with a computer designed to fit in one beautiful centerpiece. And inside the attractive frames of our All-In-One Desktops, you’ll find the functions that make your life easier. If you choose a Pavilion with an SSD, you’ll get responsiveness that’ll amaze, and with an HDD, you’ll have all the room you need to archive all of life’s moments. We offer multiple USB 2.0 or 3.1 ports, so you can stay connected. And if you need the perfect webcam, we have the HP Privacy HD Camera that keeps you protected whenever it’s not active. Whether you're switching back and forth between an important report or bringing up that one show you can't miss, our all-in-one computers give you a smooth and responsive system paired with the speed you need to get things done, when you need them done. If you’re looking for computer speed that works now and into the future, you have options for models with AMD Dual-Core A-Series processors, or even 7th Generation Intel® Core™ i5 and i7 processors. 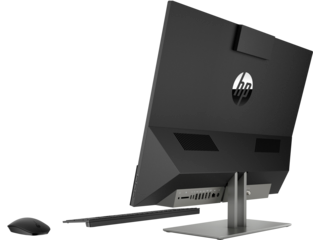 With graphics options such as AMD Radeon™ R5, R7, or 530, or Intel® HD Graphics 630, you’ll have more than enough firepower to get through your daily tasks—and unwind when your to-do list is completed—no matter which Pavilion model you choose. 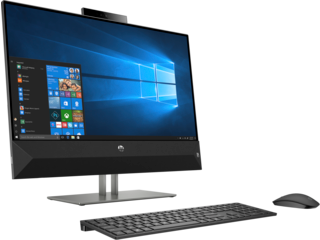 When there’s a lot you want to see, our HP All-In-One models give you a display big enough to take it all in. 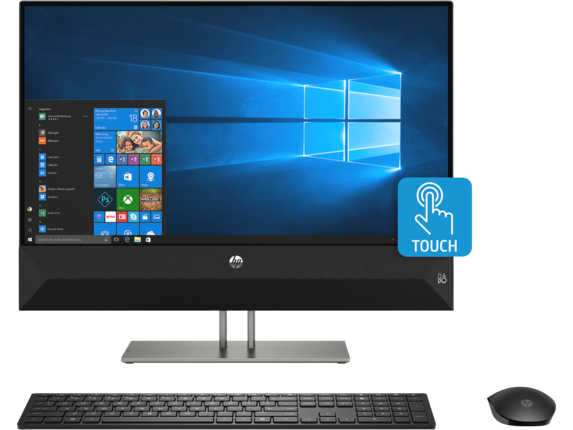 With 23.8” Full High Definition touch displays, you can interact with whatever’s on your screen, or kick back and just enjoy the experience. If you have bigger ambitions, the 27” Envy 27 AiO will help you see even more with a picture that could make anyone stop and stare. Whether it’s a 4K display or FHD, you’ll find one that catches your eye. We know audio is just as important, and we’ve made sure you won’t miss a single conversation, song, or bit of a dialogue. Thanks to the included dual 2 watt speakers powered by B&O PLAY, you’ll get the entertainment experience you deserve. 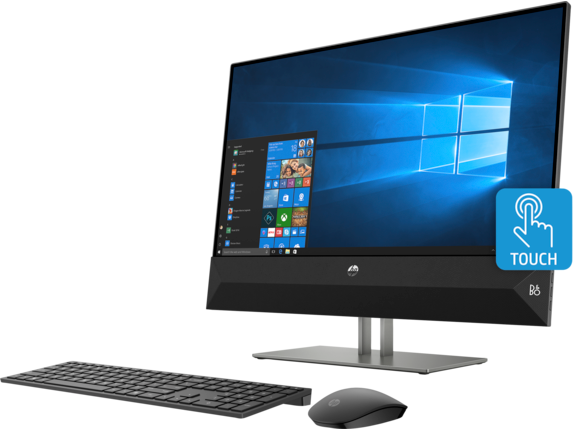 If you want to free up space without losing anything in the performance department, we’ve got all-in-one computers that will be there to handle any task your household throws at it.